A turbine mounted in the flow tube of the Turbine Flow Meter, Counter, and Batching Unit Model DR15 is rotated by the flowing liquid. The rotary motion is sensed by two reed relays via a magnetic coupling, and transmitted to an electronic in the form of a frequency proportional to the flow. The electronics module calculates the flow rate and the total quantity and operates a transistor contact, which is available to energize a pump or a valve when a programmable total quantity has been counted. 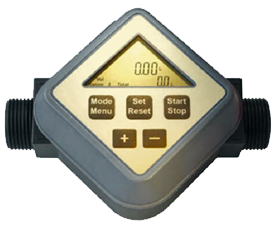 This product sold by PKP Process Instruments, Inc., a joint venture of Clark Solutions and PKP Prozessmesstechnik GmbH. Clark Solutions participates in the US Federal Contractor Registration System for Award Management (SAM) Registration.